Heat oven to 425°F. Remove crust from pouch; press in bottom and 1 1/2 inches up side of 9-inch springform pan. Bake 9 to 11 minutes or until golden brown. Place chocolate chips in medium microwavable bowl. Microwave on High 40 seconds. Stir; microwave 5 to 15 seconds longer or until chocolate is melted and smooth. Cool 3 minutes. In large bowl, beat condensed milk, liqueur, eggs and melted chocolate with electric mixer on medium speed until smooth. Pour into cooled baked shell. Bake 15 minutes. Reduce oven temperature to 350°F; bake 20 to 30 minutes longer or until center is set. Cool completely on cooling rack, about 1 hour. Refrigerate 2 hours. In medium bowl, beat all topping ingredients except additional cocoa and chocolate curls with electric mixer on high speed until stiff peaks form. 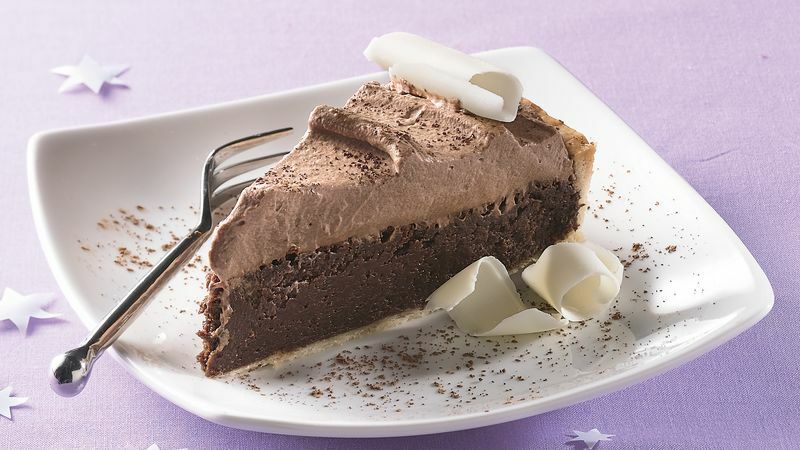 Spread topping over tart; sprinkle with additional cocoa and garnish with chocolate curls. Store in refrigerator.